A dynamic speaking style along with compelling animations, charts and typography is the best way to connect with your audience. Effectively-designed slides that complement what is being said can be a powerful combination that enables audience members to absorb and truly understand the content being presented. Here are some tips to showcase your personality and deliver a better presentation. PowerPoint can be used as an incredibly effective visual aid. It’s a vehicle that helps deliver your message and facilitates your ability to get your message across verbally. Use charts, text and images to support your main points. Don’t crowd slides with too much information. Rather, break up these points and create individual slides that present your message clearly so that the audience can follow along. You may need to reference your slides from time to time, but don’t forget to look at the audience. This builds a connection and shows that you know your content well enough not to rely on notes. Practice looking ahead, not at the floor or the ceiling, and always look at audience members when they are asking questions. This not only shows that you are confident, but also that you care about the people you are speaking to. Be genuine. If you believe in the ideas that you are presenting, you should be able to deliver them with confidence and conviction. If it is appropriate, use anecdotal examples to connect with your audience and don’t be afraid to let some of your personality shine through. This will also have the effect of making you feel more comfortable. If the setting is correct, a well-timed joke can accomplish a great deal. It can put an audience at ease or regain their attention. It can also vary the flow of a presentation to keep it from getting stagnant. However, a bad or inappropriate joke will lose an audience just as quickly. Run any jokes by a trusted third party before you try them in front of an audience, And, of course, if you know that you are not a naturally funny person, there is nothing wrong with avoiding jokes altogether. Practice reading the text of your presentation in a natural, conversational way, as if you were speaking to friends or colleagues. This will help you to avoid speaking in a monotone. Also, try not to appear too stiff in your delivery. If you have room, feel free to move around and experiment with hand gestures. Impressing your audience during a presentation requires two very important things. Great slides and a practiced, confident speaking style that remains focused on delivering the message. By combining these two very important components, you’ll find that you truly have the power to make the most of your time in front of an audience. 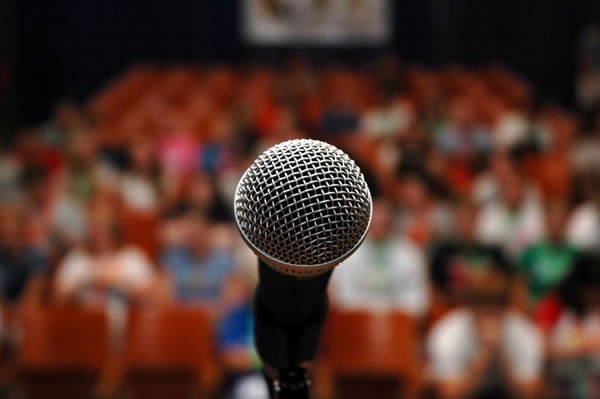 Previous PostEffective public speaking: 3 ways to improve your presentation skills!